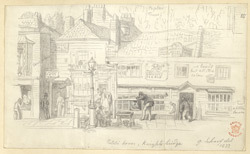 This lively drawing depicts the White Hart pub in Knightsbridge. The White Hart lay close to Westbourne Brook, a water course fed by five streams which joined near Kilburn. The brook rose in West Hampstead and flowed under Knightsbridge and south to the Thames. A bridge that crossed the Westbourne was where, according to legend, two knights fought to their deaths. It is due to this legend that the village came to be called Knightsbridge. The area was plagued by highway men and became celebrated for its taverns. The White Hart was an old establishment, appearing in 1631.